In traditional astrological magic, the use of elections is a powerful method to generating talismans and objects of incredible power. An election is a time specifically chosen where a particular planet, house, lunar mansion, or star is well-placed and well-dignified; things done or created under this influence will greatly absorb or be affected by this influence, helping to radiate it out later. It’s like taking the idea of natal astrology and turning it on its head: instead of analyzing the influence of a person born or event begin at a particular time, you time something to take advantage of some astrological phenomenon. The creation of astrological and planetary talismans makes great use of such elections. Of course, getting an election right can be tricky, and for some of the slower moving objects of the solar system, there could be spans of years between decent elections. As it turns out, I happened upon a decent election for the planet Saturn. Since I’m greatly benefited from Saturnine influences and wanting to dabble in astrological magic, I decided to take advantage of this Saturn election and make my own talisman of Saturn, which would help give Saturn and its energies and spirits a solid anchor in my life. For where I live in the US, the time and date of the election was on September 17, 2011 lasting from 2:05 p.m. to 2:44 p.m. EDT, with the election exact at 2:29 p.m. Saturn was at 17°03′ Libra, giving it dignity by exaltation, triplicity, and face. This occurred on the planetary day of Saturn and in the second of four planetary hours of Saturn for that day. Plus, it’s conjunct the midheaven at the highest point of the sky at that time. Not a bad election for something like this. It so happened that Saturn was conjunct my Sun around this time of my life, which adds a distinct personal touch and meaning to the consecration. The weather, overcast, chilly, and dry, made the day all the more appropriate for the consecration. A kamea is a magic square, a n × n square of numbers that add up to the same number across each row and down each column. Each planet’s kamea has n = the number associated with that planet, in this case three (which, dear reader, you’ll find crop up again and again and again). Like many magic squares, kameas can form powerful talismans on their own, but was here used as a pedestal and mini-altar for the consecration ritual itself. The construction of the kamea was easy and simple enough: woodburn the numbers into the wooden plaque, add a few decorative touches here and there, paint it black, then apply lacquer. All this was done in the hours of Saturn on a Saturday. I melted several lead weights down using a propane torch, a heavy steel ladle used as a crucible, and a flat steel pot to pour the metal onto. Afterward, I took a metal mallet and flattened it out on a smooth hard surface. I shaped metal disc into a circle using scissors and a file to make it a little more appealing than an amorphous flat blob. Lead is really easy to cut and shape, so this was simple. Based on the size of the resulting talisman-to-be, I drew up a design for the talisman on the computer. The talisman design incorporates the kamea, seal, and symbol of Saturn, the seals of its spirit and intelligences, and its related sephirah and name of God. I engraved the talisman with a point-press engraver. 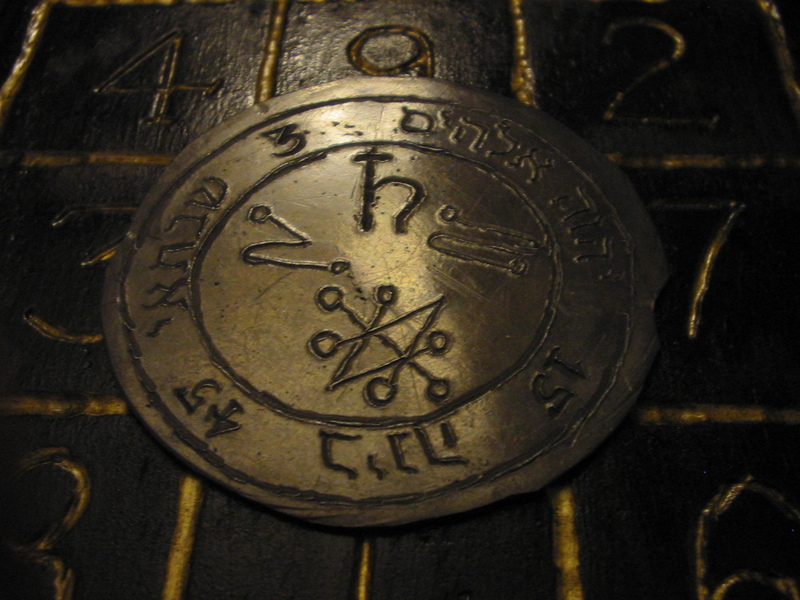 I added several things to the talisman that wasn’t on the design: the numbers 3, 15, and 45 (numbers relating to Saturn via its kamea) between each of the Hebrew inscriptions around the front of the talisman, and the names of Saturn in Latin (SATVRNVS), Greek (ΚΡΟΝΟΣ), Arabic (Zuhal, زحل), and Sanskrit (Śaniḥ, शनिः) around the kamea on the reverse of the talisman. I cleaned off and polished the now-complete talisman. To prepare myself for the ritual, I held myself to a strict diet and lifestyle from September 10th to the 17th, and fasted from Friday morning until after the ritual. I performed an offering to Saturn during a Saturn hour of each day, burning a black candle and myrrh incense and reciting the Orphic Hymn to Saturn while anointing the talisman with myrrh oil, suffumigating the talisman in the incense, and asking Saturn to fill it with his power. Finally, the day of the election came. At dawn in the first Saturn hour of the day, I did my normal Saturn offering and invocation, meditated, dressed the three black candles with myrrh oil and consecrated them to Saturn by engraving its symbol on them and suffumigating them in myrrh incense, then prepared the altar. The altar was oriented to the south, the direction in which Saturn would be at the time of the election. I covered the altar with the black cloth, set the Lamp to the east of the altar, set the censer to the west, set the kamea of Saturn in the middle and arranged the three black candles around it in a triangle, pointed towards the south. Before the ritual, I showered, shaved, and dressed up in nice black clothing with a long ceremonial black scarf, black dress shoes and socks, and my black rings, including my special hematite ring I wear for magical ceremonies on my little finger. I lit my Lamp, a new white candle that represents the Infinite Light of God, to mark that I was getting ready to do something special, followed by the charcoal in the censer. The candle and charcoal were then exorcised. I said a few prayers that I normally do before rituals, including the Prayer of Hermes Trismegistus and the Prayer of Joseph the Visionary. I knocked three times on the altar to signify the opening of the ritual space, then sprinkled holy water around the area. I lit the three black candles around the kamea of Saturn I burned earlier. I threw the myrrh and mullein onto the charcoal to get them smoking. I touched and intoned each number of the kamea, then placed the talisman onto the kamea. I recited the Orphic Hymn to Saturn three times. I called out the Invocation of Saturn from the Picatrix three times. Below is the text from the Picatrix, with modifications appropriate for the occasion. O you Lord, whose name is mighty, whose appearance great, whose pneuma elevated, O you Lord Saturn, you, cold, dry, dark, doer of good and ill, upright in love, oath keeper, friend, unique, incomparable, rich in understanding, impenetrable, keeper of promises, tired, indolent, who keep to yourself in trouble and sorrow, you who remove yourself from friends and gaiety, old in years, rich in cunning, experienced, wily, deceitful, clever, understanding, you who bring increase and who destroy, whose disfavor brings misery and whose favor happiness: I beg you, primal father, by your great good deeds and noble attributes, allow this talisman to end the procrastination, tiredness, blockages, obstacles and unhealthy belief systems and bring immediate abundance, prosperity and success in my all undertakings. Grant it that it may grant me the necessary solemnity, sobriety, acceptance, obedience, diligence, discipline, structure, stability, understanding, knowledge of myself and my boundaries, and all other qualities, traits, skills, powers, and blessings of Saturn that I require in my life, sphere, and surroundings. In the name of God and in the name of the angels Heylil and Isbil, who are set over Saturn in all cold and ice, the Lord of Seventh Sphere, I invoke you by all your names: in Arabic Zuhal, in Latin Saturnus, in Hebrew Shabbathai, in Persian Kewan, in Greek Kronos, in Sanskrit Shanaishchara! By the Lord of Highest Edifice, may you grant my request and listen to my call, and obey in obedience to God and his rulership and allow this talisman to end the procrastination, tiredness, blockages, obstacles and unhealthy belief systems and bring immediate abundance, prosperity and success in my all undertakings. Grant it that it may grant me the necessary solemnity, sobriety, acceptance, obedience, diligence, discipline, structure, stability, understanding, knowledge of myself and my boundaries, and all other qualities, traits, skills, powers, and blessings of Saturn that I require in my life, sphere, and surroundings. I said a prayer of thanks to the gods and the spirits of Saturn, gave leave to all the spirits that attended the ritual, and formally closed the ritual area. I timed the ritual so that step 7 happened right at 2:29 p.m. I felt a presence descend on the area as I called out to Saturn after the candles were lit, and I felt it kinda wrap around me and the area as I called out for the talisman’s consecration and lingered until I formally closed the ritual space. Being near Saturn felt like putting on a really heavy coat without the warmth, just weighted down. After the ritual, I meditated on all this Saturnine influence and power I had called down while letting the candles and incense burn out, giving the talisman time to soak up the light and scents of Saturn. The following is what I ended up visualizing. I imagined a door, black with a white threshold and truncated at the corners and a white doorknob; on the door was a symbol of Saturn roughly painted in white. I opened it up and found myself in this dark, dark cave filled with black transparent crystals, like obsidian quartz or something. There was no light, but everything glittered. I felt around for a bit, and part of the rock wall to my left crumbled away, revealing a small tunnel. I walked through it and found myself in this large cavern with a black lake, and in the middle of the lake was a small island with three columns. A boat was anchored near my end of the lake, so I used it to get to the island; after walking around the columns, I noticed that between them was a small altar with a roughly-hewn stone. A pillar of light was shining from a hole in the cavern above onto the altar. I picked up the stone, and the tops of the columns, which were slanted away from the altar, fell onto the altar into a perfect triangle. Out of the stone came a dark red butterfly, which flew over the water and was eaten by several fish that jumped up out of the lake at once. The hole in the ceiling crumbled away, letting in more of the light to cover the island entirely. A small child walked up to my left and smiled, helped me put the stone back onto the altar, and then I was ushered back into the first cave I was in with all the crystals. I then decided to try climbing up, since there seemed to be a sort of ledge high above me, and after what felt like an hour (more like five minutes, but this is the mental realm, so whatever), I reached the ledge and found another tunnel. At the end of this were two dark brown doors lined in gold, and inside I found another cavern with a huge statue of the god Saturn, bearded, wizened, and with a huge scythe over him. Around in on a circle engraved on the ground were two hooded people kneeling and, I think, praying; I joined them at a space equidistant from either and eventually lost myself. I found myself standing in front of that first Saturn door again, and opened my eyes. Later on in the evening, after all the candles burned out and I was able to clear off the altar, I performed a conjuration of Tzaphqiel, the archangel of Saturn, and asked him, along with the planetary intelligence and spirit Agiel and Zazel, to further empower and consecrate the talisman, making sure that the thing would be completely soaked and filled with all the forces of Saturn that might help me out. In addition, I got instructions from Tzaphqiel on how to best treat and incorporate the talisman into my life, including “feeding” it afterwards to keep it active and empowered. I felt the same heavy, slow, almost lethargic feeling around me during and after the conjuration, to the point where most motion gave me nausea. I’m not even going to complain about the quality of the finished product. This is the first time I melted down metal into a usable form (and something kinda poisonous, no less!) and engraved it. Sure, I could have learned how to actually give the thing a fine polish and ash rubbing to darken the engraving, but I’m rather pleased with how it turned out. I noticed it becoming heavier or more numinous over the course of the extended consecration, which is a mark of this thing really getting charged. I plan to keep it activated for a long time, if not forever; according to my natal chart, Saturn is a highly beneficial force in my life. As for the ritual, I learned that burning mullein leaf with myrrh isn’t a great choice; it just smells heavy and thick and something that brings the phrase “rubbery death” to mind.